I think this issue is really important for a number of reasons, and I’m delighted to see a politician taking it seriously. Firstly, the media can mislead the public on individual issues, like MMR. Secondly, and perhaps more importantly, they mislead the public more insidiously, undermining their understanding of the basics of science, of what it means for there to be evidence that something is good for you or bad for you, of how we gather evidence, and of what scientists actually do. Lastly, it is really important that people who work in science share their passion and their knowledge with the public. Lord Drayson recently announced that public engagement activity will be rewarded in the Research Assessment Exercise: it’s excellent that the importance of public engagement is being recognised, but to expect that this should be done through the mainstream media, who have proven themselves to be so iffy, is like serving lambs up to the slaughter. I think one of the most interesting parts of the evening – alongside “yes it’s rubbish, no it isn’t” – will be discussions on alternative routes to engage the public in science that bypass the evils of mainstream media. Science reporting: is it good for you? 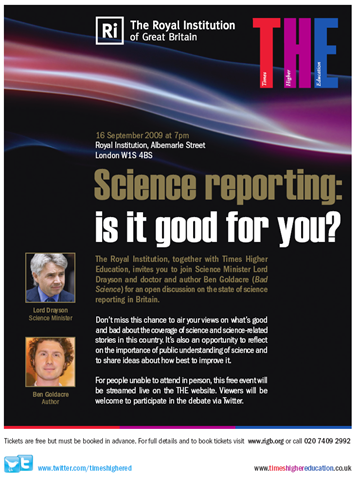 The Royal Institution, together with Times Higher Education, invites you to join Science Minister Lord Drayson and doctor and author Ben Goldacre (Bad Science) for an open discussion on the state of science reporting in Britain. Don’t miss this chance to air your views on what’s good and bad about the coverage of science and science-related stories in this country. It’s also an opportunity to reﬂect on the importance of public understanding of science and to share ideas about how best to improve it. For people unable to attend in person, this free event will be streamed live on the THE website. Viewers will be welcome to participate in the debate via Twitter. Will video/audio of the event be available online later? Can’t see that a debate on Twitter would be very useful. Many questions/points worth raising are going to be too long for it. I that a way of censoring questions that might require real answers? It is very important that scientists elaborated on their credibility and in some way to generate confidence about medical issues, because we know that science, evolves and the people who are not aware of it ever learns to understand the differences, which in these times are very important. Sounds good, though I’m not clear what the output of the discussion will be, or what is expected to change as a result. I guess as long as the grown-ups start thinking about the issue seriously, that must be a good thing. 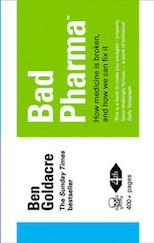 PS Can your techie mate not do something to stop the Health Pain spamming on this blog? I’ve recently made a proposal for a MySociety project to try to improve science reporting with distributed fact checking. Please see www.mysociety.org/2009/08/26/scientists-say/ if you are interested, and do comment with feedback. I’m stating the obvious, but this could easily descend into a game of “look at these examples of rubbish reporting” versus “yeah but look at these examples of good reporting”. How do you intend to make the general argument, with supporting data (while still giving some juicy examples)? Sounds interesting. And it would be good to know what we as scientists can do to promote good science reporting. If the rae rewards press coverage, that puts a lot of pressure on me as a scientist to get my work written up In the popular press. But I know that if I spin my work in a silly and exaggerated way, it is more likely to get coverage. So current policies might make science journalism worse by encouraging scientists to over spin results rather than to counter the spin. Do you think there is anything we can do about this? I’d love to be able to ‘say no to spin’ but I fear that could hurt my career. Here’s one idea, if you’re in academic science: Insist that, as a matter of integrity and professorial prerogative, that the university require pre-approval of any press release they send out that includes any academician’s name in it. Get it written into a formal policy or bargaining contract. “I won’t sign off on this misrepresentation of my work, and the faculty will pitch a screaming fit if you send it out without my approval” is a fairly powerful lever for moving the publicity office. Alternatively, if your colleagues don’t mind having their reputations diminished through errors made by their own institution, you can take individual action by encouraging the publicity folks to believe that if you disagree with the press release, you’ll personally post a (very) public correction. I assume the real academic big hitters either have it in their contracts or have sufficient power that the press office wouldn’t dare release without approval. Otherwise i expect to see “Dawkins: God might exist” as a headline in the near future. Can you sue your employer for libel?